Terraced house "Maison Chateaubriand". 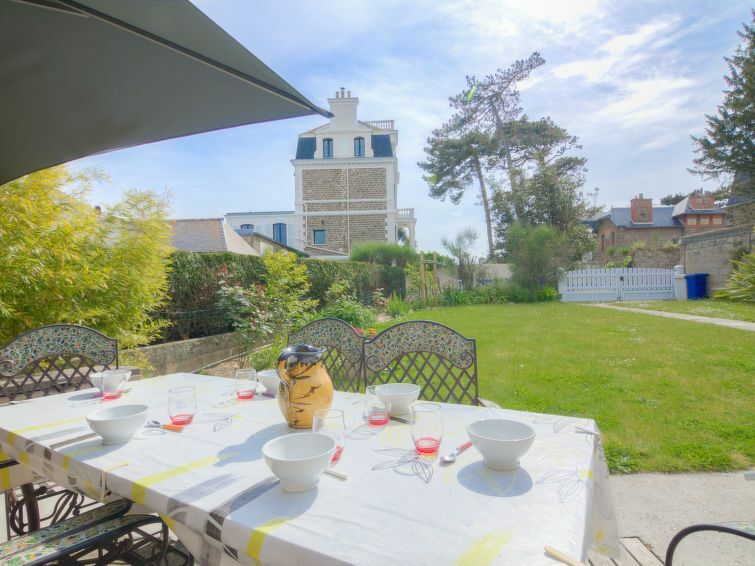 In the district of Sillon Courtoiville, 150 m from the sea, 150 m from the beach. Private: natural garden 150 m2. Table tennis, terrace (10 m2), public parking on the road. Shop, supermarket, restaurant 100 m, sandy beach "Plage du Sillon" 150 m, park "La Briantais" 6 km, diving center 3 km, indoor swimming pool 3 km, thermal baths "Thermes Marin" 500 m. Sports harbour 2 km, golf course 18 km, surf school, sailing school 500 m. Nearby attractions: le Mont St Michel 57 km, Dinan 33 km, Dinard 13 km, Cancale 14 km, Zoo de la Bourbansais 38 km, Grand Aquarium de St Malo 6 km. 3-room terraced house 150 m2. Object suitable for 4 adults + 2 children. Living/dining room with panoramic window with TV (flat screen). Exit to the garden, to the terrace. 1 room with veranda, sliding door with 1 french bed (1 x 160 cm, length 190 cm), shower/WC and TV (flat screen). Exit to the garden, to the terrace. Kitchen (4 hot plates, oven, dishwasher, microwave, electric coffee machine, Capsules for coffee machine (Nespresso et Senseo) extra). Exit to the garden, to the terrace. Upper floor: 1 room with 1 french bed (1 x 140 cm, length 190 cm), TV (flat screen). Gallery, with sloping ceilings with 1 french bed (1 x 140 cm, length 190 cm). Shower/WC. Gas heating. Beautiful view of the garden. Facilities: washing machine, dryer, iron, hair dryer. Internet (WiFi, free). Please note: non-smokers only. Smoke alarm.